The centennial of World War I, arguably the seminal event of the 20th century and ironically termed “the war to end all wars,” is producing a great deal of new scholarship that tests long held myths and brings a renewed focus on a war that has been long-ignored by many military historians. The horror of trench warfare and the staggering casualties have perpetrated a narrative of waste, ineptness, and slaughter on a scale difficult for Americans to understand in an era of drone warfare and precision air power. Sir Max Hastings, one of the most prolific military historians of his generation and winner of the 2012 Pritzker Military Library Literature Award for Lifetime Achievement in Military Writing offers his perspective on the beginning of the Great War in this new volume. Mr. Hastings has widely written on World War II and brings a unique perspective as both a historian and journalist to catalogue not only thoughts and actions of politicians and generals, but ordinary soldier and citizens caught in the sweep of the events of 1914. What makes this book really stand out is Mr. Hastings’ deliberate efforts to puncture what he labels the many myths and legends of the events of 1914. 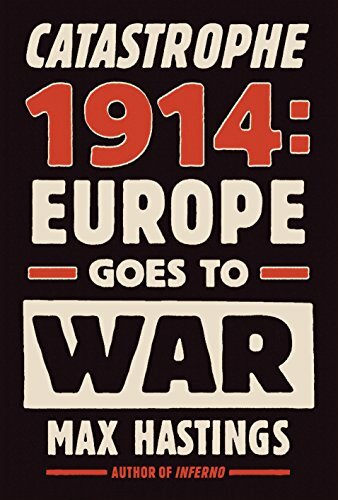 The first theme the reader notices is that World War I was not really an “accidental” war the great powers blundered into and which no country really wanted to fight since Europe was divided into armed camps with firm alliances and rigid mobilization and offensive military plans. On the contrary, the leaders of Russia, Germany, France, and even Britain, went to war for what they perceived as genuine threats to their countries in a conflict that most of the military and political leaders considered inevitable. Moreover, nearly all the major political and military leaders, except for a very few insightful naysayers, assumed the war would be quickly resolved in their favor. Leveraging his experience as a military historian, Mr. Hastings does an excellent job of analyzing the second major theme of this book—the colossal changes to the nature of warfare that all of the generals failed to consider, and their subsequent inability to bring the war to the quick and decisive finish desired be each of the warring powers. World War I really marked the ascendancy of logistics as the primary factor in warfare, overturning the Napoleonic model of a brilliant tactical commander achieving a single, smashing blow to the enemy army. The German offensive into France, the Austrian invasions of Serbia, and the Russian invasion of East Prussia all eventually petered out because armies could no longer live off the land with millions of soldiers, thousands of horses, and hundreds of artillery pieces to support. Although railroads were utilized by all the powers to move men and supplies, the bulk of supplies and artillery pieces were still horse-drawn. In addition to logistical issues, the speed and mobility of offensive armies were never greater than their defensive opponents, so as the Germans advanced on Paris, their troops became more exhausted and their supply lines more extended, even as the French were falling back on their capital and were better able to shift troops around to meet German attacks. The mechanization of warfare using the truck, airplane, and later in the war, the tank, was virtually non-existent in 1914, and the armies of the day simply could not move fast enough on foot to conquer the tyranny of distance required. It would take another quarter century for armies to develop the technology and doctrine to overcome these challenges of speed, time, and distance, but in 1914, fast marching troops simply wore themselves out. Mr. Hastings uses this analysis to refute the speculation made by many historians that if the Germans had not transferred some of their forces to East Prussia to halt the Russians, they could have overcome the French. These additional corps would have faced the same logistic and mobility problems and had even further to march if they had extended the German right flank on their sweep to Paris. In addition, armies were now so massive that commanders could not maintain control of them with only wired telephones and primitive wireless communications. Mr. Hastings cites this lack of command and control as a major factor in the French victory on the Marne as the German 1st and 2nd Armies operated practically independently of each other, allowing a huge gap to open between them the French and British were able to exploit. In both situations of logistics and command, 20th century armies had simply become too massive and complicated to move, control, or feed with the primitive methods of 19th century warfare and undeveloped technologies. Once the chance for a quick victory fades in the mud and rains of fall 1914, Mr. Hastings chronicles the changes in the soldiers, politicians, and citizens as the prospect of a long and terrible war with unforeseen consequences begins to replace the initial euphoria many felt. The beginnings of trench warfare, and Mr. Hasting’s first hand descriptions of the mud, blood, and nearly constant combat and death waged at Ypres in the fall of 1914 is a bitter foreshadowing of the futile carnage to come in 1915 and 1916 as generals throw masses of troops against enemy machine guns, barbed wire and artillery. By his own admission, Mr. Hastings concentrates his narrative on the events in Europe, although he does allocate one excellent chapter to the naval engagements and skirmishes between the British and German navies in the early months of the war. Readers looking for the story of the colonial wars fought in Africa and Asia in 1914 will need to seek other works, such as Hew Strachan’s The First World War: Volume I: To Arms. Mr. Hastings considers these theaters tangential to the primary campaigns in France and Russia, although tactically interesting to students of military history. Yet Mr. Hastings really understands the value of maps to understanding the sweep and scale of the 1914 engagements, especially the German drive on Paris, and the provided maps are uniformly excellent. Any book on the beginning of World War I will inevitably be compared to Barbara Tuchman’s masterpiece The Guns of August and Sir Max will survive that comparison with flying colors. His deep research, insightful analysis, and wonderful prose make this excellent addition to his long library of titles. This volume is a highly readable account of a war Europe completely misjudged in terms of bloodshed and cost—a war that destroyed three dynasties, remade the map of Europe and set the state for mankind’s bloodiest century.